Capturing the most fleeting of moments—like the droplets formed by a splash of water or the ripping plastic from an exploding balloon—used to be expensive propositions. Fancy photo strobes with special voice- or sound-activated switches (called VOX) costing hundreds of dollars were the equipment of choice for high-speed photographers. Not so, anymore. By tapping into the powerful tools housed inside disposable flash cameras, you can build your own high-speed photography system for under $30. Warning: Before you start working with the flash mechanism from a disposable camera, remove the battery and make sure that the onboard storage capacitor is completely discharged (hold a pair of insulated pliers across the + and - flash terminals and manually trigger the flash). Step 1. The Anatomy of a Flasher. Remove all of the exterior plastic, film advance system, and shutter assembly from the disposable flash camera. Locate the + and - flash terminals. These terminals are located near the shutter. Use a voltage meter for identifying which terminal is positive (+) and which one is negative (-). 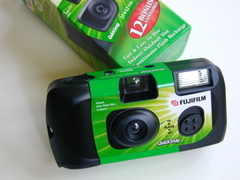 Some cameras (e.g., Fuji QuickSnap, as pictured) might require the flash on/off switch to be soldered in the “on” position. Snip off one jack of the 3.5mm stereo cable. Prep the snipped end exposing the red, white, and black wires. Solder the cathode pin of the SCR to the negative (-) flash terminal and solder the anode pin of the SCR to the positive (+) flash terminal. Solder the red and white wires from the 3.5mm stereo cable to the SCR’s gate pin. Finally, solder the stereo cable’s black wire to the negative (-) flash terminal (along with the SCR cathode pin). Remove the cassette tape door from the cassette recorder. Make sure that you have clear and easy access to the cassette recorder’s write-protection button. 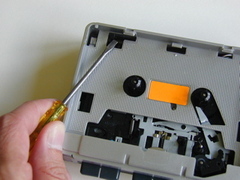 This is a small movable “finger” opposite the record head that determines whether or not a cassette tape can be recorded. This button must be depressed to turn the cassette recorder on in “record” mode. You will use the “record” mode for gathering sound and amplifying it enough for triggering the flash. Find a darkened location for experimenting with high-speed photography—an area completely devoid of ambient lighting. Mount your camera on a tripod, set the shutter for a bulb or “B” exposure. Cameras that can deliver timed 1-4 second exposures can also work. 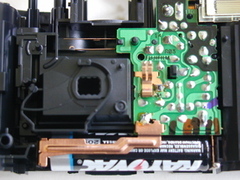 Insert fresh batteries into the disposable flash camera. Plug an inexpensive electret microphone into the recorder’s “MIC” input. Plug the jack of the 3.5mm stereo cable into the “PHONE” output. Hold down the recorder’s write-protection button and press the recorder’s red “RECORD” button. The flash should begin charging. [NOTE: some disposable cameras might require you to depress a flash activation button.] When the amber “ready” light glows steadily on the back of the disposable camera, the flash is ready to be triggered by sound. Kill the lights, hold the flash trigger near your subject, open the camera’s shutter, and record some high-speed event that is triggered by its noise. Like the pop of a balloon, the kerplunk of water, or the smack of a head slap. Take your pick and take some pix. So from reading these instructions, I could not determine at which point the flash actually triggers the camera to take a picture. Seems the flash will fire but what about the shutter? Actually, the same circuit can be used to fire the camera shutter so that you don't have to do everything in the dark, yesterday I butchered a cheap RS-80N3 (Canon EOS DSLR Remote) clone and used it with an SCR to trigger the shutter. It isn't suitable for all subjects though as the point of the flas is that it triggers extremely quickly. I would like to build one of the high speed flash setups so that it triggers the shutter also as described by Daniel. I'm not too up on cameras or electronics. My question is whats a "SCR to trigger the shutter"??? Where can I find an SCR without having to pay $7 for shipping? What/where exactly are the cathode and anode pine of the SCR are? i like this and as for your question jordan (not that you'll probably look back since you posted it 3 days ago but oh well) depending on what SCR you get there should be a way to tell, like a - and + sign, but it all depends on who made it. Are you using a 2d camera to actually capture the picture or is the disposable camera taking the picture. Have built this, it is highly sensitive to sound no matter what level volume is at, flash activates alot. Can't get it to work with the disposable taking the picture. Too many things going on, the shutter is a cheap piece of plashtic and it falls off in dark, etc. set the shutter for a bulb or “B” exposure. Cameras that can deliver timed 1-4 second exposures can also work. The health benefits of drinking water are numerous, particularly when compared to other beverage options. But, the importance of drinking water that is not contaminated cannot be overemphasized.